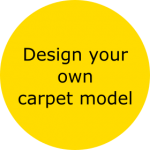 Own carpet model manufactured by EKO – cavitycotton, which is recycled cotton (80/20). Washable and colorfast. Finnish and hand-woven with high-quality carpet. Carpets minimum length is 1 meter.